Update: We’ve added three more hair styles to this series, check them out here! When Bloomies approached us about doing a post about hair for girls, (and 30% off for readers and $200 giveaway in the post above!) we knew we’d have to call upon some professionals. Salon K, a local full-service salon had us over and brainstormed some awesome easy hair tutorials for little gals as well! Check out Salon K’s blog and Facebook page deals and more hair inspiration! 1. Create a ponytail on the crown of the head. 2. Leave a piece of hair the circumference of a dime (or so depending on how thick you want the braid to be!) out and put the rest of the hair in a messy bun. 3. Braid the piece of hair you left out and twist around the base of the bun and secure with a bobby pin. BASKET BRAID with a bloom clip: 1. All you need to do for this one is use the same braids as above, but instead pull each braid down and around the base of the head and secure with bobby pins. 2. If the hair is pretty long you may need to zig-zag the braid across the head and pin as you go. 3. Pin the other braid as before. 4. Tuck the tails under the braid and secure with bobby pins. MILK MAID with a bow: 1. Create two pigtail braids on the side of the head just behind the ears. 2. Separate the braid a little with your fingers to create thickness. 3. Pull one braid up over the head (like a headband) and secure with bobby pins. 4. Pull the other side up and over (either a little ahead of the first braid, or a little behind) and secure with bobby pins. 5. Tuck the tails of each braid into the braids and pin in place. 1. Pull the hair into a loop at the crown (see image 1) of the head leaving tail out on the top of the loop. 2. Separate the loop into two equal parts (see the bow?) 3. Using the tail of the original looped ponytail to secure the two parts of the loop to the sides, pull that loop up and over between the loop. 3. Secure the tail in place with bobby pins. Pull a skinny strand of hair from the outside of the right section, pull it over the right section, then weave it under the left section. 4. Keep alternating sides until you reach the bottom of the braid. secure with a hair tie. The cutest girls. And I love these tutorials! Will definitely be referencing. Thanks! they’re all so lovely! 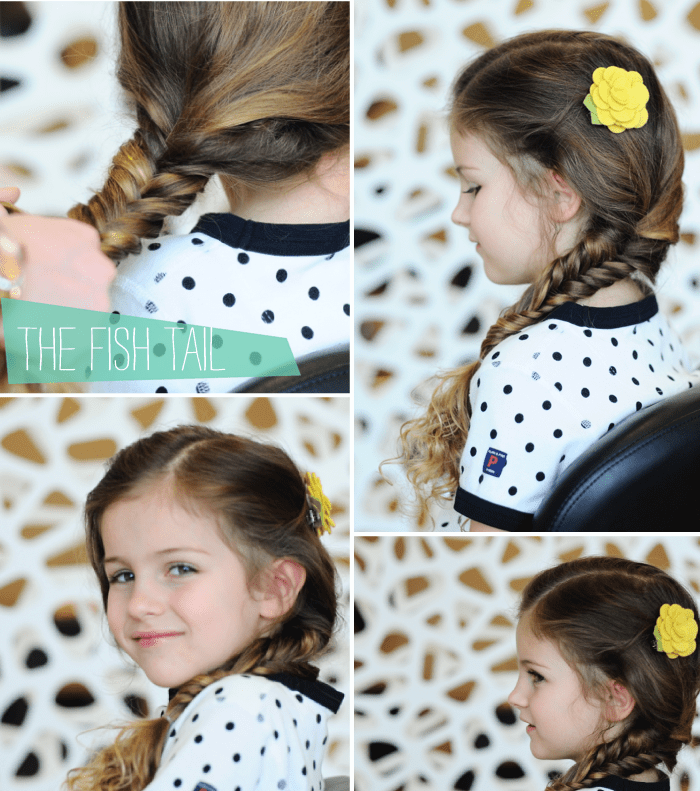 I will be trying all of these out… fishtails are always so pretty..! In our house, the top knot is the go-to quick, cute ‘do! However, I am modeling that look soon! Soo adorable. All of it. Beauties! Love the “milk maid” hair style! These are the cutest hair dos for girls! I totally need to do something like this with my sweetie! Your blog is super cute, I am glad I found it! !